In the space of two weeks, the nursery has gone from a state of concern for being out-of-water and out-of-space to hold ageing tubestock into winter for delayed planting projects… to a state of concern for soon-being-out-of-stock as those field planting projects jump back into high gear before the start of winter. Such is the nature of revegetation. It has been a good summer of production in the nursery. A steady supply of seed from public, staff, volunteers and members has kept our seed-processing bench an unruly collage. This in turn has kept the propagation tunnel well stocked with enough greenery for me to suggest double-shifts at the potting bench… but it turns out I don’t supply enough ice-creams for double-shift-work. It makes me think of a phrase I first heard in the political sphere – “try to please everybody and you’ll end up pleasing nobody”. At the end of the week, or month, the nursery seems to end up muddling through and perhaps pleasing the majority somewhat serendipitously. Someone mentions a species we should have more of and the next week, another person arrives with some seed. Certain species were not being produced fast enough or in sufficient volume for particular projects, but then seasonal delays gave more time for additional stock to be hardened, or a changed assessment of site conditions allowed additional in-stock species to fit the bill. Muddling is not the ideal production method of course. There’s room for improvement, but with so many plant species in the equation and a variable number of hands around the nursery on any given day it seems it will retain its presence. Perhaps if we simply reclassify it as ‘stochasticity’ it will seem far more intentional, intellectual and ecologically sensible. Water consumption has always been an issue in nursery production and this nursery is no exception. The prolonged hot dry summer saw the nursery dam reaching empty once again, and plans were in place (again) to expand it. Then it rained! Such a blessing doesn’t take away from the fact that our irrigation layout has many variables to address in regard to water efficiency. Edges, droplet size and distribution, the moisture retention of the potting media and ideal irrigation timing are the few key aspects at present. Look up a Best Practice manual and there’s plenty of information on how to assess and address irrigation efficiencies. Some of the solutions come with considerable price tags, others are simply not an option in an already established facility. Thankfully a lot of the groundwork was done at construction for enabling good water usage, so now it is mainly a case of refining what is in place rather than re-inventing a wheel. The increased demand for production over summer highlighted a few weak points in the production chain. Some of those, such as potting techniques, have been relatively easy to implement improvements; educating volunteers on best practice techniques for seedling prickout, potting, root-and-shoot grading and record keeping. The education is ongoing of course – we all know how hard it is to break old habits! But the new information has been well received, and to their credit, the volunteers have even tolerated me introducing them to different techniques that didn’t end up being as successful as I boasted they should be! Potting productivity is not just about the people. The physical space, the location of inputs, the flow of the processes all play a part. I am sure, that if I were to provide enough beer and ice-cream at the end of the day, I could double the potting rate (whilst still upholding stock quality). But we’d need room to place those extra plants. Reconfiguring existing infrastructure is no small decision to make. Especially at the time of year when said infrastructure is full-up with seedlings and tubestock. Some of our infrastructure is being upgraded out of necessity – there is only so many times a rusty bench can be given a new lease on life – but even that brings its own interruptions to stock production. Improvement in the nursery is not just about productivity. Record keeping is a very important part of the nursery operations, especially when dealing with a few hundred different species in plants and seeds, some of which are very specific in their natural distributions. Some of our stock includes species that are not local natives and are intended only for landscaping purposes. So having our plants identified correctly from seed source right through to the sales counter is important for the customer and the environment. Stock identification is an ongoing job – there are always new species to learn about as well as keeping the existing stock correctly labelled. Perhaps one day some of this quality control will be aided by computer-based record keeping, but for the time being it falls to us humans to steadily and collectively improve our identification and labelling skills and methods. As I finish typing this article, a cool SW wind pushes the summer heat away. Autumn has arrived it seems. The effect on nursery production, like every year, will be noticed all the way to December now. The height of the growing year is over. Cool nights and shorter days will drop the propagation rates significantly. Many species will not germinate effectively over winter months; seed may remain dormant until spring arrives or even rot in the cooler, wetter seedling trays. It will be a time to turn focus to other tasks about the nursery. 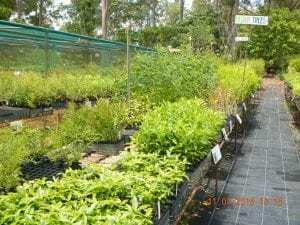 But this autumn is set to see most of our current stock leaving the nursery for field projects on a scale that Gympie Landcare has not experienced for many years – so we cannot turn all our attention away from propagation, even if nature recommends it!